CWIT’s work is centered around helping aspiring tradeswomen reach their fullest potential and become skilled, tradeswomen, accessing good blue-collar jobs with benefits that enable them to build stable, long-term careers in the industry. Achieving this goal begins with a training program that is responsive to the requirements of the industry and the needs of its participants, but does not end there as women continue to face significant access and retention barriers in the industry. If you are or are considering providing pre-apprenticeship training, you are likely already aware of the considerable benefits of this model for training and advancing a skilled, well-paid workforce. These benefits are even more important for women seeking to build careers in nontraditional occupations, because most programs assume a lack of experience and provide extensive classroom and on-the-job training ending with an industry recognized credential that should put them on an equal footing with other job applicants and ensure continued, high-wage, employment. Moreover even apprentice wages, which currently average $17.00 per hour in the Chicago area, represent a significant increase in the incomes of most program participants. More importantly, apprenticeship is an “earn while you learn” model which does not require an upfront investment in training and education and essentially pays you to learn valuable skills. If you are new to the construction industry, the most important advice this site can provide is that it is critical to understand the precise requirements of each apprenticeship program and carefully track openings, build relationships with apprenticeship programs, debrief applicants and learn as much as you can about the selection criteria of each program. For more information, download our participant manual, which includes a section on typical apprenticeship program requirements and application processes and visit the Department of Labor’s Office of apprenticeship here- http://www.doleta.gov/oa. It is important to keep in mind that there is strong competition for apprenticeship slots and, for the most part, women will have to out-compete dozens if not hundreds of men to gain acceptance. Though apprenticeship programs have goals for women’s participation and are, depending on the state you live in, accountable to the U.S. Department of Labor’s Office of Apprenticeship or the State Apprenticeship Committee who monitor them for compliance with EEO regulations, they do not, as a rule, rank women separately or give any special consideration to female applicants. The application process and the intention of the program involved both play a key role in the success of female applicants to a given program. Generally speaking, the more objective the process, the more likely women will be accepted. For example, a program that requires a passing aptitude test score and uses a lottery selection process will likely accept a greater percentage of women than a program that relies on interviewing, factors experience into a ranking score or requires an intent to hire letter from a contractor. Interviews, conducted by contractors and union officials, are not objective and women can be disadvantaged in the process, not just by their relative lack of experience and potential interviewer bias, but by differences in communication styles that, in this particular universe, may serve to make women appear less confident, less skilled, and less committed to this career path. More information and tools to assist you in building women’s interviewing skills can be found here. Involving apprenticeship programs in delivering training to your participants can go a long way toward building their confidence in the quality of your program and the readiness of your participants for the industry. CWIT, for example, works very closely with our local apprenticeship programs, and a portion of the hands-on curriculum is designed by apprenticeship programs and hosted at their facilities by instructors and women in their union. This allows apprenticeship programs to control the message they wish to communicate about their programs and gives them the opportunity to see the participants in action. At the same time, this obvious investment in recruiting them and meeting experienced tradeswomen from that field encourages women to follow through with an application if they enjoyed the field trip and the women are employed and happy with their careers. Greater confidence in the program can certainly improve program outcomes, in some cases, as tangibly as the assignment of a point value in the applications process for a certificate of completion from the Technical Opportunities Program. Apprenticeship program staff also participate in mock interviewing to give our students a realistic experience and opportunity to hone and tailor their answers to the expectations of the industry. It is similarly challenging for women, without significant related experience or connections to the industry, to successfully obtain a letter of intent to hire from an individual contractor who may not even be open to the idea of employing women and is, in any case, not likely to be willing to make this level of commitment to an untested, unknown applicant. There are times, however, when a letter of intent to hire process can work to your advantage as it allows contractors, who may be seeking women to meet an EEO goal, to sponsor new candidates if there are none available through the apprenticeship program. Improving women’s retention, advancement and leadership in apprenticeship, in the union and on the job is critical to achieving equity for women in these fields. While there are many variables involved in assessing women’s retention in the industry, it appears that women lag just a few percentage points behind men in terms of graduation rates, but many drop out just a few years later. CWIT is in the process of conducting a retention study, interviewing women graduating from or otherwise leaving apprenticeship and found that, while there has been some improvement in conditions for women in the trades, lack of equitable on-the-job training and employment opportunity continue to derail many women’s careers. Other issues, including sexual and other forms of harassment, isolation from co-workers and work expectations that can, at times, be incompatible with raising children, also continue to be barriers for many women. While some have been successful, women in general have not become integrated into the core crews that work the most stable hours and the most overtime, and instead, continue to be among the last hired and first fired. If a company is not invested in you as a new apprentice, you are unlikely to receive quality training and, as the years go by, it gets more and more difficult and discouraging to find that next job and meet contractor expectations. The need for job placement assistance, then, doesn’t end with acceptance into apprenticeship as, in many cases, apprentices, and more often journey level workers, are responsible for finding their own work. These are complex issues that are not readily solvable, but there are things you can do as an organization to support tradeswomen and promote equitable worksites. 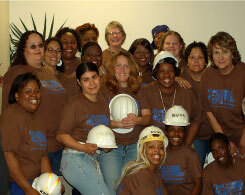 In 1992, CWIT conducted a retention study, entitled Worksite 2000, Breaking New Ground, which documents in detail the retention issues tradeswomen face and offers recommendations of pro-active steps for employers, unions, apprenticeship programs and public agencies to take to ensure greater female participation and retention. To facilitate their adoption, CWIT provides direct technical assistance to individual contractors and unions offering support, guidance and plans for creating equitable worksites, with the goal of improving tradeswomen’s hiring and job retention. These services range from providing sexual harassment prevention policy and diversity training, and establishing employment database and referral systems. Increase fair treatment in hiring, training, and work assignments. Case studies of six sites, detailing the recommendations adopted and the results achieved, can be found in our publication: Build Equal Opportunity. Though these projects provide a strong model for achieving significant outcomes, the possibility of enforcement, or at least public scrutiny, is an essential ingredient in motivating contractors to step outside their normal hiring channels. There are, however, some promising incentive based strategies, most notably the earned Credit Program (ECP), developed through a community hiring initiative led by the Illinois State Toll Highway Authority. The ECP was created to increase the participation of qualified women and minorities on Tollway projects by offering contractors, who hire and retain applicants from affiliated training partners, credit toward their next bid. For more information on this successful partnership visit their website at www.illinoistollway.com. More recently, the Policy Group for Tradeswomen’s Issues in Boston has developed a highly successful coalition based approach to site based hiring, described in its report Finishing the Job. Government contracting agencies are in general a good place to start in identifying projects and building partnerships for developing equitable job sites. To begin to establish such relationships, research public works projects, including highways, capital improvement projects, etc., and identify likely partners such as universities, transportation departments, capital development boards, school districts and other contracting agencies. There are also government agencies, such as the Office of Federal Contract Compliance Programs (OFCCP), that oversee EEO compliance, in this case, of federally funded contractors. This agency monitors contractors receiving more than $10,000 in federal funds for compliance with Executive Order 11246, based on random selection, complaints from applicants, workers or a third party, and inclusion on a site designated as a “mega-project”. According to these regulations, contractors most show that 6.9% of work hours were performed by women or document that a “good faith effort” was made to achieve this goal on the federally funded project as well as any other current contracts. For contractors that fail to meet these goals, the OFCCP will provide them with contact information for your organization in a “linkage letter” provided at the close of the audit. Your city or local area may have its own ordinance or strategies, such as a community benefits agreement, that you can connect with to ensure that there are goals for women on publicly funded projects and that efforts are made to achieve and enforce these goals and promote women’s retention on the site. Also included on the side bar are a range of materials and links to resources to assist you in developing and implementing strategies for expanding opportunity for women in the industry. Though a woman’s career in the industry is often dependent on external factors, some of these can be avoided or ameliorated if she has the awareness, support, resources, strategies and confidence to overcome the challenges she is likely to encounter. Below are some ways you can facilitate support for tradeswomen and promote retention and advance of women in the industry. 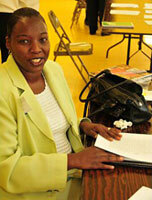 Informal and formal mentorship are critical elements of CWIT’s program. Throughout the training program, participants meet numerous tradeswomen who, in addition to sharing their experiences and skill with students, are responsive to their needs as they prepare for and enter apprenticeship programs. In many cases, participants are able to initiate these relationships themselves. Other times, staff makes these connections. Mentoring takes many forms, but tends to work best as a function of the tradeswomen’s support groups described below. These group activities, involving experienced as well as new entrants, provide mentees and mentors with the opportunity to build one-on-one relationships in the context of an issue or skill-building seminar. Sample forms for enrolling mentors and program agendas are available in the tool section. Often isolated on the job, subject to inequitable treatment and more vulnerable to lay-offs, all tradeswomen, whether they are just starting out or have been in the field for 20 years, can benefit from a connection to a larger group of women who share their experience. Monthly meetings of tradeswomen offer an opportunity for women to share stories and strategies for looking for work, maintaining employment and advancing on the job. Typically beginning their trade careers at a disadvantage in terms of hands-on experience, this gap can widen rather than close over time as women are often receive less technically challenging assignments. Trade-Specific hands-on workshops are designed to provide tradeswomen in the field with a non-judgmental safe space to enhance and practice the skills they may only get to experience rarely in their apprenticeship training program or on a worksite. These skills fortify their confidence and ability to handle a variety of job opportunities that may not correspond with their on-the-job experience and prepare them for advancement opportunities. Promote increase and diversity in women’s numbers and retention through the creation of a supportive environment at the apprenticeship school, at the local union level, and on jobsites. Promote the trade to women and support union/apprenticeship staff in outreach. Provide mentoring and support for each other. Identify issues, propose and advocate for solutions. Build a visible community of tradeswomen. Foster women’s increased representation and leadership in union activities. Offer sample contract language or policy for training programs to promote equitable and family-friendly practices. Host conferences, meetings and social activities. Discrimination is against the law and efforts to build women’s participation in the industry are supported by federal laws and regulations that exist to ensure that women have equal opportunity to enter and advance in construction career, information about which can be found in this section. Chapter 3: What's a Nice Girl Like You Doing in a Place Like This?